News you can use about traveling to Yellowstone National Park in Wyoming with kids or friends. What happened to Yellowstone Treasures’ recommended trails? Comments Off on What happened to Yellowstone Treasures’ recommended trails? 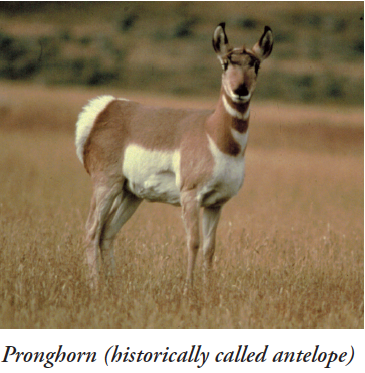 What happened to the number of trails we recommend between the fourth and fifth editions of Yellowstone Treasures? Between publication of our fourth edition in 2013 and fifth edition in 2017, the number of recommended hiking trails in our short walks table (pages 366 to 368) shrank from fifty-six trails to fifty-four. Here’s what happened in the interim. First, the good news: We now recommend one formerly omitted trail; the access to it reopened after a construction project was completed. This is the level Fairy Falls and Imperial Geyser Trail, about 6.4 miles round trip, described on page 67. Two projects completed just last month (July 2017) add to the lure of this trail. A large new parking lot makes the trail accessible to more people. Even better, a side trail with steps now leads steeply up the hill above the incredible Grand Prismatic Spring for a view almost equal to those you see in pictures taken from the air. The three trails no longer on our recommended list are: from the Old Faithful Village area, part of the Mallard Lake Trail; from the West Thumb to Fishing Bridge segment, Lakeshore Trail, east segment; and from the Mammoth Junction to Norris Junction road segment, the Superintendent’s Campground Road Trail. I’ll explain why these are no longer in our trails table. 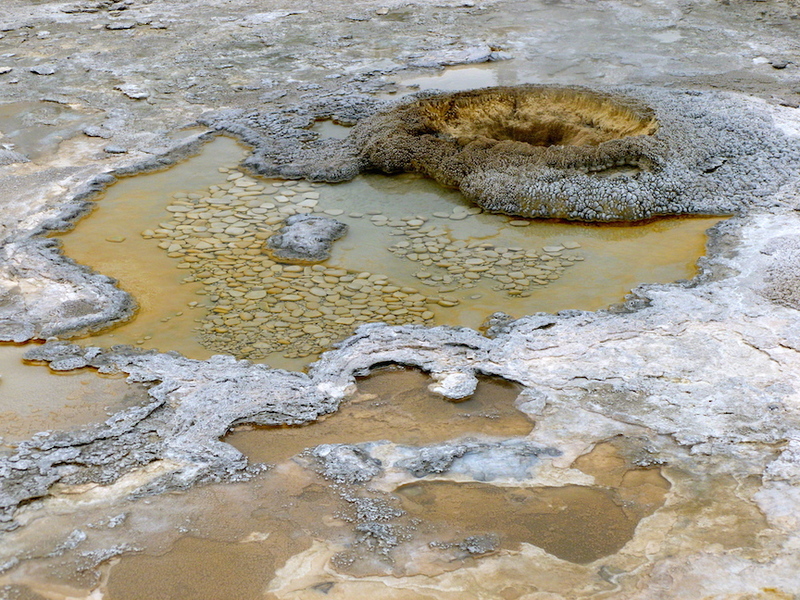 Until a few years ago, one could hike the Mallard Lake Trail for a short distance to see some hot pools and mud pots called the Pipeline Group, named for a former pipeline that ran in the area. Now those features are closed off to hikers. The part of the Lakeshore Trail that led east from the meadow below Lake Lodge to Fishing Bridge is no longer maintained. And the Superintendent’s Campground Road from the Indian Creek Campground is also now closed off by park administration. This leaves us with only fifty-four shorter trails to recommend. Maybe if you stayed all summer, you could do them all. . . . 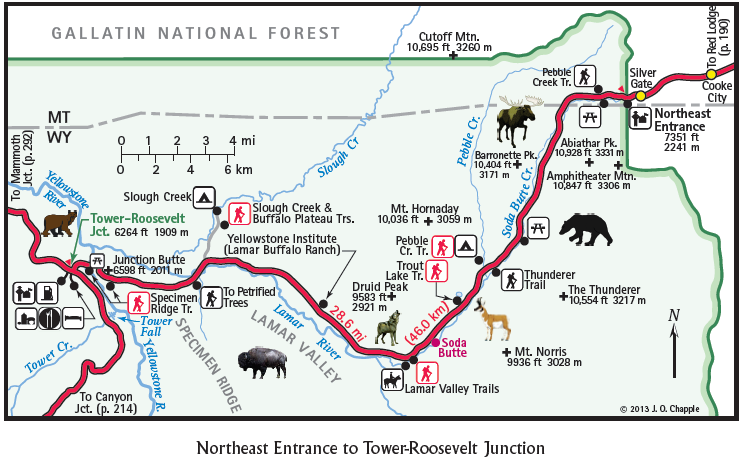 Please be aware that some trails on both rims of the Grand Canyon of the Yellowstone are currently under construction. 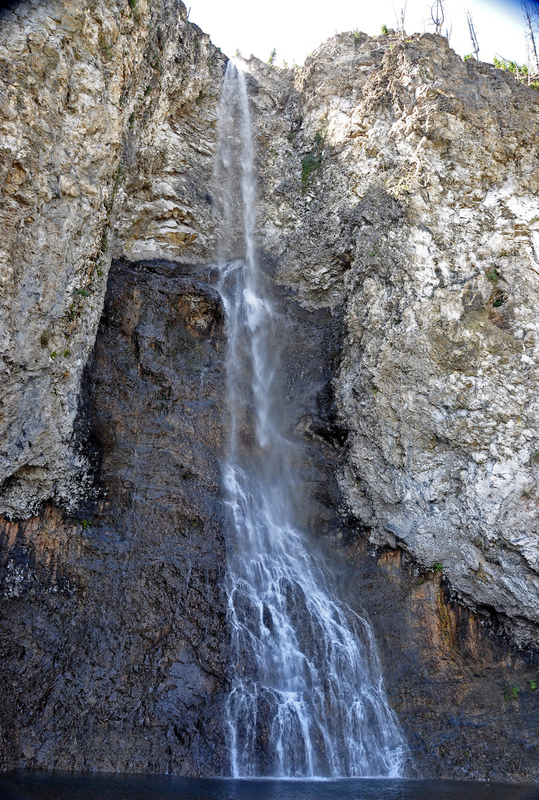 When you are at the Canyon Visitor Center be sure to ask which trails are open. Mud Volcano area in winter. As of today Yellowstone is still covered in snow; most travel by car starts April 21, 2017. March—while you may still be wishing for spring—is a great month to plan a summer or fall trip to Yellowstone. Here are some ways that Yellowstone Treasures can help you plan, especially if you haven’t been to the park before. Yellowstone has become so popular—with over 4.2 million visitors last year—that almost all the in-park cabin and hotel rooms are already booked. I have to blame this mostly on the large bus tours that book blocks of rooms a year or more ahead, knowing they can fill up their tours with no trouble. This leaves us individuals and families who plan later in the year with little recourse but to book rooms in gateway places like West Yellowstone, Moran, Cody, Cooke City, and Gardiner. You can, of course, book a space in campgrounds or in the only RV camping spot, if you are so inclined. Fortunately, the gateway towns have lots of accommodations. You will find phone numbers and email addresses for the chambers of commerce of all the gateway towns in the back of YT, as well as how to contact the park concessionnaire, Xanterra (or Yellowstone Park Lodges). Also, see our Yellowstone Links for the chamber of commerce websites in those places. Online resources such as Booking.com can be a great help with finding rooms outside the park. A chapter near the beginning of Yellowstone Treasures tells you all about the five different entrances to the park and what you’ll see on their approach roads. The bulk of the book (pages 38 to 301) is what you’ll use before you go, while you’re there, and for reference when you return home. It’s full of detailed maps made and kept up-to-date by my incomparable mapmaker, Linton A. Brown. Here is one from page 200 of the guidebook. Photo credit: Janet Chapple, 2012. Great bike-riding opportunity this month! Comments Off on Great bike-riding opportunity this month! Some of the plowed roads in Yellowstone are open for just a short time every year to bike riders. This great opportunity to enjoy the road from West Yellowstone to Mammoth car-free lasts until April 15th, when the other park roads gradually open to motorized vehicles. You can enjoy the quiet, the animals, and all the beauties of the northwest part of the park on two skinny wheels. Click here for all the details. Note that the road from Madison to Old Faithful is closed at this time for bear management. The same privilege is offered by Glacier National Park in northern Montana, another paradise. But Going-to-the-Sun Highway requires really ambitious bike riders with good brakes! 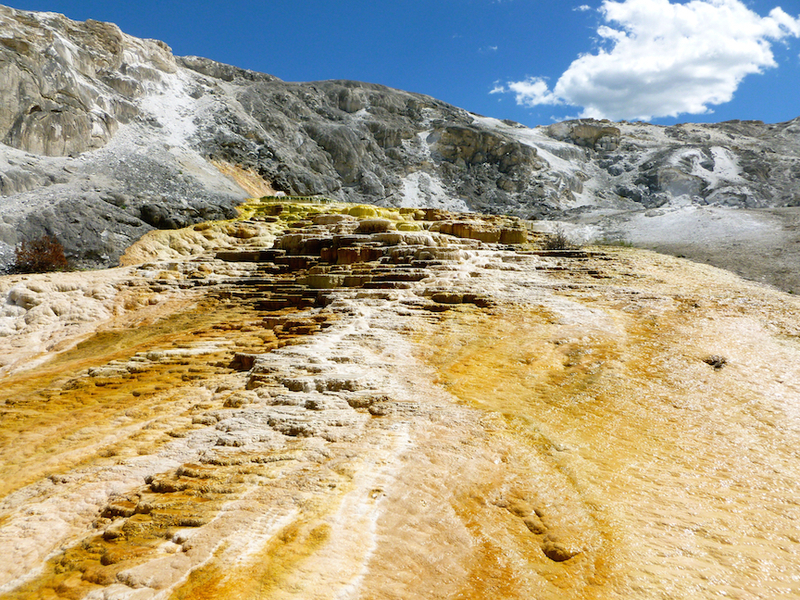 Comments Off on Nature cooperates with Yellowstone! 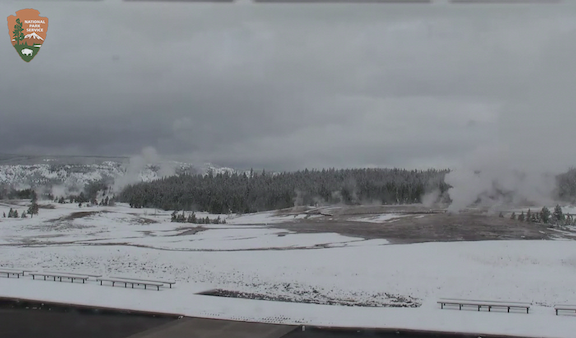 Just this morning I’ve found for the first time this fall that the National Park Service webcam at Old Faithful is showing snow covering the Old Faithful / Upper Geyser Basin area. It is interesting to notice where the black sinter-covered ground still shows—these are areas where the subsurface is warm enough to melt snow no matter what the air temperature may be. 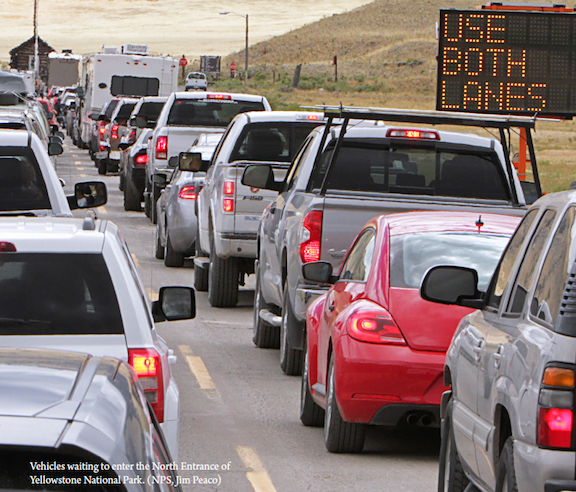 This is nicely coordinated with the closing of all Yellowstone roads to wheeled traffic, except for the all-season road between Gardiner and the Northeast Entrance near Silver Gate and Cooke City. 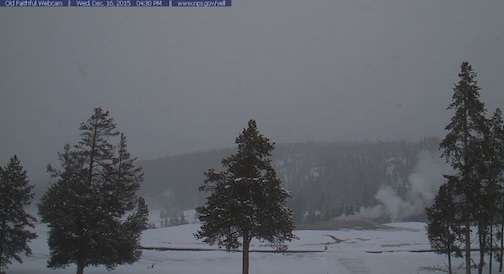 There are seven webcams of different parts of the park accessible at the NPS webcams page. 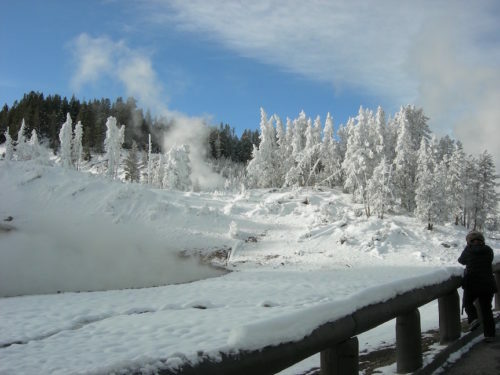 If your winter Yellowstone visit reservations are not yet made, call concessioner Xanterra at: 307-344-7311 NOW!